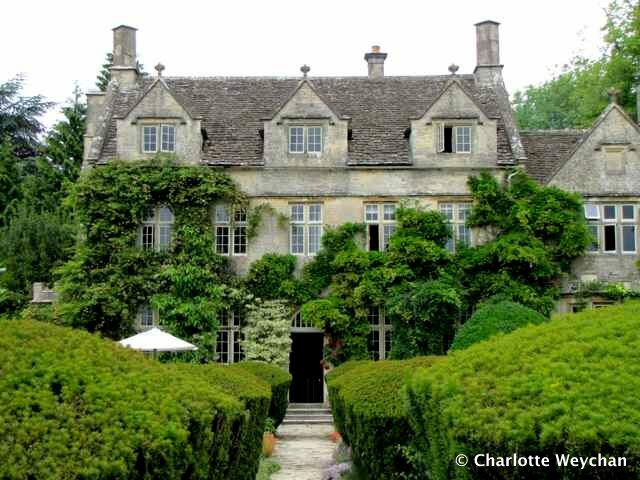 Barnsley House, former home of the late Rosemary Verey - well-known garden designer, lecturer and writer - is one of the gardens I've been trying to see for a long time. And I finally got there this week, not just to enjoy the wonderful gardens, but to spend the day working with one of Britain's leading garden photographers, Clive Nichols. It was a memorable day on all counts! Clive is an excellent teacher; the company - just four other equally enthusiastic students - really enjoyable; and the setting, astounding! 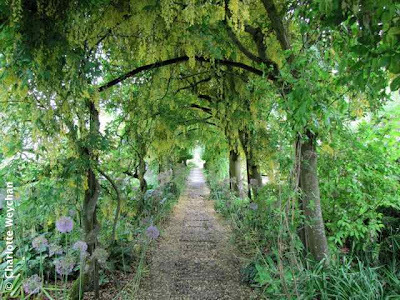 Most readers associate Barnsley House with its famous laburnum walk (above), added to the garden at Barnsley after Rosemary Verey saw the larger design at Bodnant, but sadly this was past its prime. No matter though because other parts of the garden more than made up for the fading yellow blooms, including the potager, the pond area and the glorious borders brimming with flowers. We were lucky too with the weather, because although grey storm clouds threatened to soak us ... they miraculously disappeared and we were able to work in the garden throughout the day! Another bonus was meeting Jane (above left), who was on the course with us (Clive's on the right), a former close friend of Rosemary Verey's and a truly remarkable octogenarian who regaled us with stories of days gone by at Barnsley when it was a private house and home to Rosemary and her husband, David. The most striking feature of this garden is the planting and Verey was well known for her talent in mixing and matching plants to create a sense of abandon. 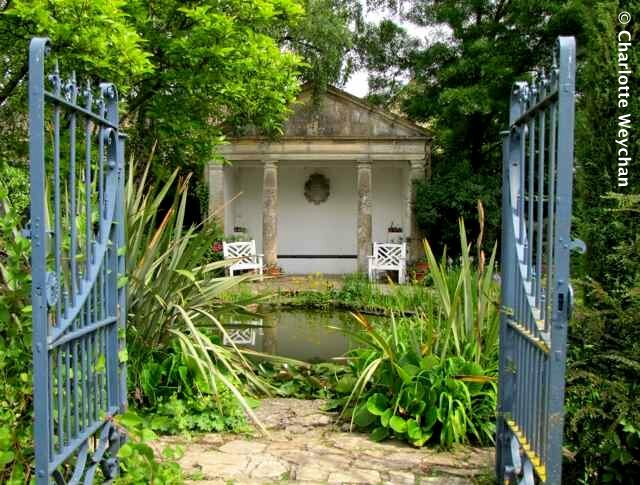 She became one of Britain's best-loved garden names and advised both Prince Charles at Highgrove and Roy Strong at The Laskett; as well as designing Elton John's garden and the New York Botanical Garden. Clive Nichols is an inspirational teacher and he spent the day helping us novices to understand composition, apertures and shutter speeds. 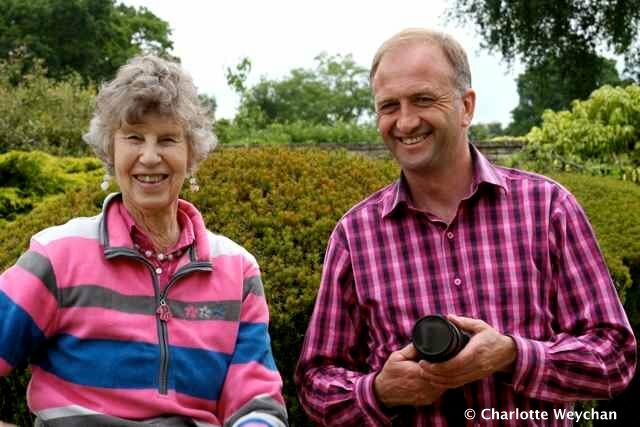 It was a great joy to work with him and we all had a wonderful day in the garden at Barnsley, which is a photographer's paradise with all its nooks and crannies. 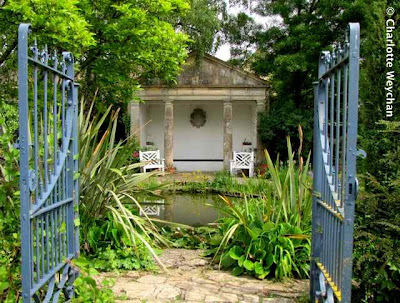 Every corner you turn gives a different vista, or another glimpse of a carefully orchestrated garden room, like the pond area (above) with its mini temple and inviting blue gates. I also had the chance to talk to head gardener, Richard Gatenby, who gave me many tips on pruning - I'll be running another post on Richard after the weekend, together with more pictures of Barnsley. I didn't stay at Barnsley because the room rates there are definitely for the rich and famous, rather than mere mortals like me, but I was more than happy with my chosen hotel at Ewen near Cirencester - The Wild Duck Inn (above) - with its charming garden, extremely reasonable prices and delicious food. 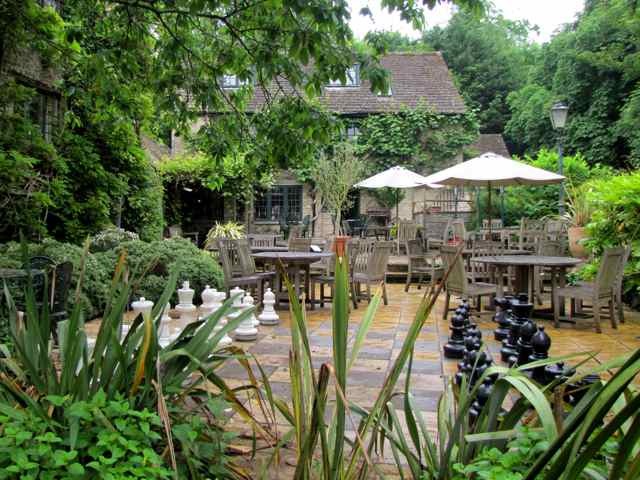 In fact, I enjoyed my stay so much that I'm returning there in two week's time to see some more great Cotswold gardens. Incredible pictures, maybe you should be teaching a course in garden photography. How very exciting to visit Barnsley House. One of the very first books I purchased when I started my own garden was Rosemary Verey's Secret Gardens. I still marvel at it's beauty. Thanks for sharing her garden with us.